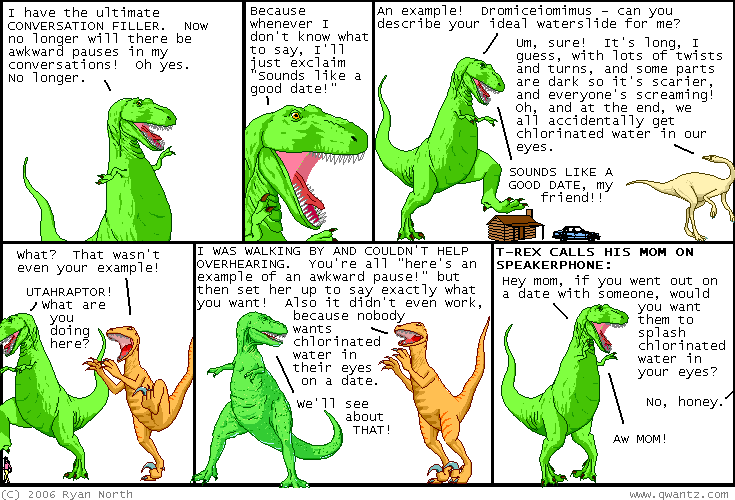 Dinosaur Comics - November 10th, 2006 - awesome fun times! –I will call this day "Dinosaur Present Day, Featuring T-Rex"! November 10th, 2006: Lore linked to this Office Space as a horror film trailer and I agree with him: there's a lot of trailer mixes but this one in particular is rad! So hey I have some good news for big guys like me! I now have 2XL sizes available for sale in each of my shirt designs. The last of the stock should be arriving next week which means hooray, shirts for the big and tall! Thanks to everyone who requested them. SPEAKING OF SHIRTS, dudes and ladies, Christmas is coming up! Christmas comes early on the internet. Christmas comes early on the internet because we need time to ship things to you and your loved one and your enemies that you buy awesome presents for anyway. If you're buying a Dinosaur Comics shirt for Christmas and are shipping to the United States, you've got to order by December 13th, otherwise your order might not get there in time. If you're shipping to anywhere else in the world, including Canada, your deadline is the end of this month: November 30th. If you order after that date it's possible that we'll be able to get your package there in time, but no guarantees. I'll be putting up some hott new pictures of people in Dinosaur Comics shirts and if you've got some, please email them to me! I would love to see them and I'm sure strangers on the internet would like to see them too!